One year ago today, the Lunar Reconnaissance Orbiter (LRO) officially reached orbit about the Moon, and in the past 12 months has gathered more digital information than any previous planetary mission in history. NASA says that maps and datasets collected by LRO’s state-of-the-art instruments will form the foundation for all future lunar exploration plans, as well as be critical to scientists working to better understand the moon and its environment. To celebrate one year in orbit, here are ten great observations made by LRO. 1. Coldest Place in the Solar System. If you think Pluto, a KBO, or the farthest reaches of our solar system are cold, a location closer to Earth is actually colder. Diviner, LRO’s temperature instrument, found a place in the floor of the moon’s Hermite Crater that was detected to be -415 degrees Fahrenheit (-248 Celsius) making it the coldest temperature measured anywhere in the solar system. For comparison, scientists believe that Pluto’s surface only gets down to about -300 degrees Fahrenheit (-184 Celsius). Extremely cold regions similar to the one in Hermite Crater were found at the bottoms of several permanently shaded craters at the lunar south pole and were measured in the depths of winter night. LRO’s views of the Apollo landing sites are nothing short of stunning, not to mention exciting. Above is LRO’s latest looks at the Apollo 11 landing site, which clearly shows where the descent stage (about 12 feet in diameter) was left behind as well as the astronauts’ tracks and the various equipment they deployed. This LRO data has important scientific value, as it provides context for the returned Apollo samples. Beyond their use for science, the images of all six manned landing sites observed by LRO provide a reminder of NASA’s proud legacy of exploration and a note of inspiration about what humans are capable of in the future. 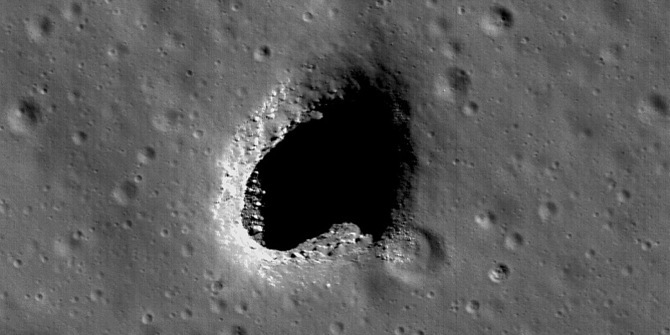 What could be more exciting than finding a cave on the Moon, a potential future lunar habitat for human explorers? LRO has now collected the most detailed images yet of at least two lunar pits, quite literally giant holes in the moon. Scientists believe these holes are actually skylights that form when the ceiling of a subterranean lava tube collapses, possibly due to a meteorite impact punching its way through. One of these skylights, the Marius Hills pit, was observed multiple times by the Japanese SELENE/Kaguya research team. With a diameter of about 213 feet (65 meters) and an estimated depth of 260 to 290 feet (80 to 88 meters) it’s a pit big enough to fit the White House completely inside. The image featured here is the Mare Ingenii pit. This hole is almost twice the size of the one in the Marius Hills and most surprisingly is found in an area with relatively few volcanic features. Lunokhod 1 was the name of a Russian robotic rover that landed on the moon in 1970 and navigated about 6 miles (10 km) of the lunar surface over 10 months before it lost contact in September 1971. Scientists were unsure of the rover’s whereabouts, though at least one team of researchers were searching for it, hoping to bounce a laser off of its retroreflector mirrors. This past March however, the LROC team announced they had spotted it, miles from the location the laser team had been searching. Using the info provided by LRO, a laser pulse was sent to Lunokhod 1 and contact was made with the rover for the first time in nearly four decades. Not only did Lunokhod 1’s retroreflector return a signal, but it returned one that was about five times better than those that have routinely been returned by Lunokhod 2’s mirrors over the years. 5. Apollo 14’s Near Miss of Seeing Cone Crater. When the Apollo 14 crew of Alan Shepard and Edgar Mitchell walked across their landing site at Fra Maura, they hoped to be able to gather samples from the rim of Cone Crater. But they didn’t ever find the rim, and without a roadmap or guideposts along the way to help them find it, (and also they didn’t have the benefit of riding on the lunar rover so had to walk the entire time). They walked nearly a mile (1400 meters) and the steep incline of the crater rim made the climb difficult, raising the astronaut’s heart rates. Plus the tight schedule of the activity resulted in mission control ordering them to gather whatever samples they could and return to the landing module. They never reached the edge of the crater. Though geologists say it did not greatly affect the success of the scientific goal, the astronauts were personally disappointed in failing to make it to the top. Images from LRO now show precisely just how far the astronauts traveled and how close they came to reaching the crater, their tracks ending only about 100 feet (30 meters) from the rim! 6. Mountains on the Moon. On the Earth, we are taught that mountains form over millions of years, the result of gradual shifting and colliding plates. On the moon however, the situation is quite different. Even the largest lunar mountains were formed in minutes or less as asteroids and comets slammed into the surface at tremendous velocities, displacing and uplifting enough crust to create peaks that easily rival those found on Earth. On a few occasions in the past year, NASA has tilted the angle of LRO to do calibrations and other tests. In such cases the camera has the opportunity to gather oblique images of the lunar surface like the one featured here of Cabeus Crater providing a dramatic view of the moon’s mountainous terrain. Cabeus Crater is located near the lunar south pole and contains the site of the LCROSS mission’s impact. Early measurements by several instruments on LRO were used to guide the decision to send LCROSS to Cabeus. During the LCROSS impact LRO was carefully positioned to observe both the gas cloud generated in the impact, as well as the heating at the impact site. Rilles are long, narrow depressions on the lunar surface that look like river channels. Some are straight, some curve, and others, like the ones highlighted here, are called “sinuous” rilles and have strong meanders that twist and turn across the moon. Rilles are especially visible in radar imagery, like that gathered by LRO’s Mini-RF instrument. The formation of lunar rilles is not well understood. It is believed there may be many different formation mechanisms including ancient magma flows and the collapse of subterranean lava tubes. Imagery from LRO will help researchers to better understand these mysterious “river-like” lunar features. One of the most vital resources LRO is searching for on the moon is solar illumination. Light from the sun provides both warmth and a source of energy, two critical constraints to exploration efforts. The moon’s axis is only slightly tilted so there are areas in high elevations at its poles that remain almost constantly exposed to the sun. Using LRO’s precise measurements of topography scientists have been able to map illumination in detail, finding some areas with up to 96% solar visibility. Such sites would have continuous sun for approximately 243 days a year and never have a period of total darkness for more than 24 hours. 9. Moon Zoo lets you Help Lunar Scientists. The latest Citizen Science project from the Zooniverse, Moon Zoo uses about 70,000 high resolution images gathered by LRO, and in these images are details as small as 50 centimeters (20 inches) across. ‘Zooites’ are asked to categorize craters, boulders and more, including lava channels and later, comparing recent LRO images to ones taken years ago by other orbiting spacecraft. The first tasks are counting craters and boulders. By comparing and analyzing these feature counts across different regions as well as other places like the Earth and Mars, Zooites can help scientists gain a better understanding of our solar system’s natural history. 10. Getting a Good Look at the Far Side. Tidal forces between the moon and the Earth have slowed the Moon’s rotation so that one side of the moon always faces toward our planet. Though sometimes improperly referred to as the “dark side of the moon,” it should correctly be referred to as the “far side of the moon” since it receives just as much sunlight as the side that faces us. The dark side of the moon should refer to whatever hemisphere isn’t lit at a given time. Though several spacecraft have imaged the far side of the moon since then, LRO is providing new details about the entire half of the moon that is obscured from Earth. The lunar far side is rougher and has many more craters than the near side, so quite a few of the most fascinating lunar features are located there, including one of the largest known impact craters in the solar system, the South Pole-Aitken Basin. 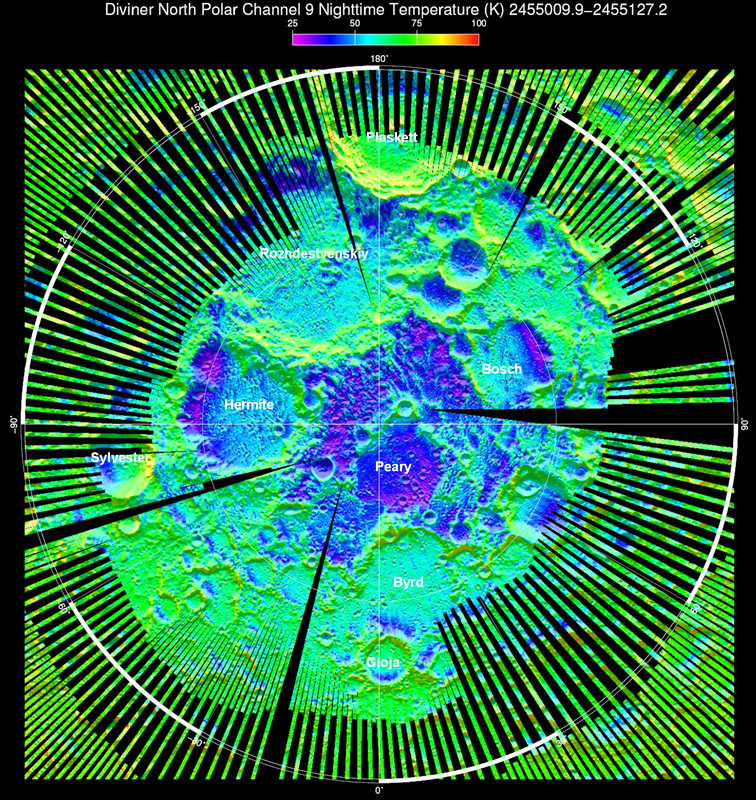 The image highlighted here shows the moon’s topography from LRO’s LOLA instruments with the highest elevations up above 20,000 feet in red and the lowest areas down below -20,000 feet in blue. See the LRO website for more info. May we assume that photos of the Apollo landing sites will stifle any further conspiracy theories about the moon landings? Or am I being naive?